I found this to be a very well-written book. It did not take long at all to really sink into Clara’s story. I loved the setting: on the coast with lighthouse. Very atmospheric. I also loved the other characters involved in Clara’s life as she tries to get past her relationship with Christian. When she meets Finn, I at first thought eek too soon!, but quickly changed my mind. It is impossible not to fall for Finn, and he really helps her overcome her past instead of helping her hide from it. That part of the story could have easily gone way off course, I’m so glad it didn’t! The story also constantly switches to the past and the way Clara met and got involved with Christian. Caletti does a very good job of balancing the “yes, I can see why she fell for him” with the “feeling of impending doom.” Really great characterization following their relationship and how scary it was. I’m not sure how I feel about how Clara ultimately ends up confronting her past: it seemed to suspend reality a tad. But then, I’ve never been in a situation that resembles hers at all, so maybe I just don’t fully appreciate it. Either way – that part kept me from loving the book as much as I could have. Regardless, I recommend picking up a copy of this if you’re a fan of Deb Caletti or contemporary young adult fiction. You will lose yourself in Clara’s journey and watch as she starts to leave her past behind. The book is released later this month, so be on the lookout! 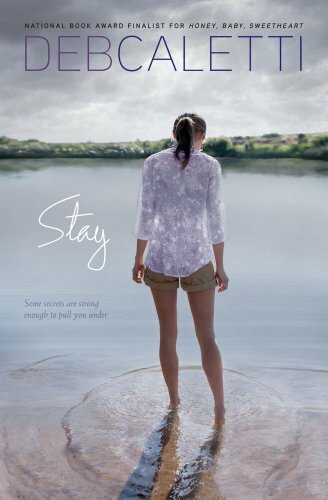 I'm really psyched that you enjoyed Stay! Also, how could you not go for Finn? SRSLY! I'm anxious to read this one! I've heard a lot of good about it.